If you're using the competitors feature for the first time, you'll be prompted to add a keyword like in the picture below. If you have already used the competitors feature for the domain you're working on, click "Manage Keywords". Enter the Google search term you would like us to track. Try to think of something your customers actually search for. You may also want to enter your company name to see if anyone else is advertising on it. For each keyword, you can decide to see results as if the search was made on desktop, or on mobile. If you want to see results for both mobile and desktop, you'll have to create two keywords with the same search term, one for mobile, and one for desktop. 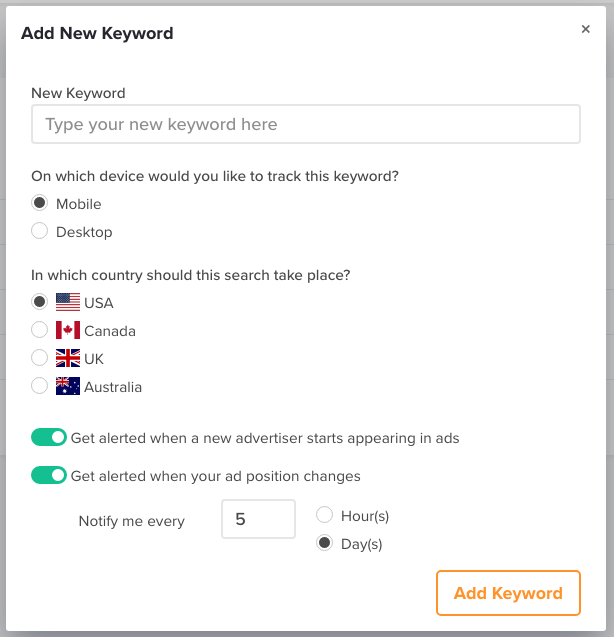 For each keyword, you can decide to see results as if the search was made from the US, Canada, the UK, or Australia. If you want to see results for all countries, you'll have to create a keyword for each. We will notify you through the email connected with the account when a new advertiser starts appearing in the ads for this keyword. We will notify you by email when the position of your ad changes during the interval that you set. Once you're happy with what you entered, click "Add Keyword". You may not see results immediately after you add a keyword. It will take us a bit of time to start collecting data before it is displayed.